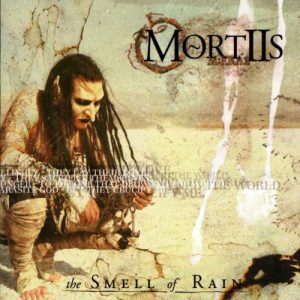 The Smell of Rain is the 6th studio album by Norwegian solo artist Mortiis. This also marks the first and only entry of “Era 2” Mortiis in which he makes an unexpected transition from dark ambient music to synthpop. This is also the first album wherein Mortiis assumes the role as lead vocalist and while he doesn’t possess the same vocal range or confidence that comes along further into his career, it’s not enough to outright dismiss his performance either. He also enlists additional vocalists including Sarah Jezebel Deva, of Cradle of Filth and Therion fame, for dramatic choral and solo arrangements that are laced together with straightforward distorted guitar work. Scar Trek/Parasite God addresses contempt for God as Mortiis decries peoples willingness to “…sacrifice themselves/to the locust master, to the one that drowned the world” while saying “yet they crucify me,” presumably for having a simple difference of opinion on theological concerns. Many of the lyrics in other songs revolve around themes of alienation and angst while the final song, Smell the Witch, is more fantasy themed and less detailed in its narrative by comparison. This is then followed by a two-part song found in Flux/Mental Maelstrom and Spirit in a Vacuum, which adds up to nearly 12 minutes between them, showing that Mortiis hasn’t lost his penchant for longer compositions in their entirety just yet. The long durations of many songs found on The Smell of Rain is also a point of contention due to the fact that they simply don’t need to be as long as they are and a more refined approach would have gone a long way in streamlining the overall presentation of the album. Monolith breaks the synthpop framework for a dramatic piano and percussion driven number that brings the distorted guitar to the forefront for the bridge of the song and Everyone Leaves is a depressing synth-driven ballad that shows Mortiis at his most defeated as he describes the futility of loss found in the refrain in which he states “everyone leaves. In the end. Everything dies. In the end. It doesn’t matter how hard you hold on.” The build-up in the last minute of the latter song is merciful after around 6 minutes of mope but this song is easily the most stretched out. Thankfully Mortiis bounces back from Everyone Leaves, particularly on Antimental and Smell the Witch. Both songs feature a cello and violin combined with the synthpop sound Mortiis has crafted but they are far more dramatic and intense than the other songs found on this album. The ending of the final track (Smell the Witch) is sudden but fitting and it will leave you with a good impression of The Smell of Rain, which will have undoubtedly alienated plenty of long-time Mortiis fans on its release but it is an important step in his musical evolution.